The Danish call it “hygge,” pronounced “hoo-ga,” translated into English as coziness. Warm fires, watching a movie while wrapped up in a blanket. Spending time with friends or family get-togethers at Christmas would also count. As the temperatures dropped this last week, I reached for my wool coat and met up with a friend at the newly opened Salerno by Chef Alessandro Pirozzi, on Beach Street. Immediately, I was overwhelmed with “hygge.” I admit I was apprehensive; the restaurant had only been open a week, following an extended renovation. It also has a new owner, Chef Pirozzi, who also owns Alessa and Mare here in Laguna, and already has quite the following as at least two sets of diners were on a return visit since reopening. It’s quite small, so make a reservation and be ready to get up close with your fellow diners as some of the tables are elbow to elbow. 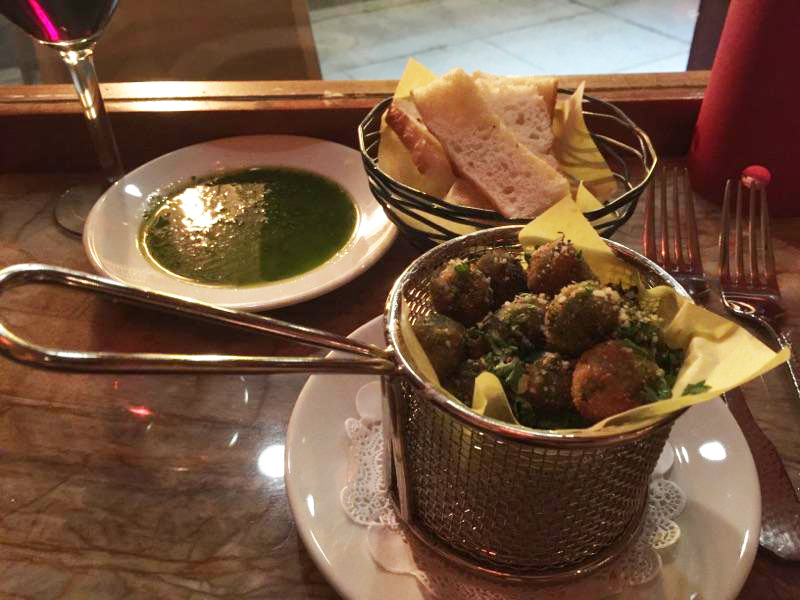 Wanting to chat, we opted for the street facing bar-style seating by the window; my friend and I enjoyed our people-watching while dipping into a “nut-free” pesto with lightly toasted focaccia. She raved about it, but I prefer mine straight out the oven and springy in texture. It also wasn’t offering a full menu yet; a full range of desserts and coffee is still to be introduced. 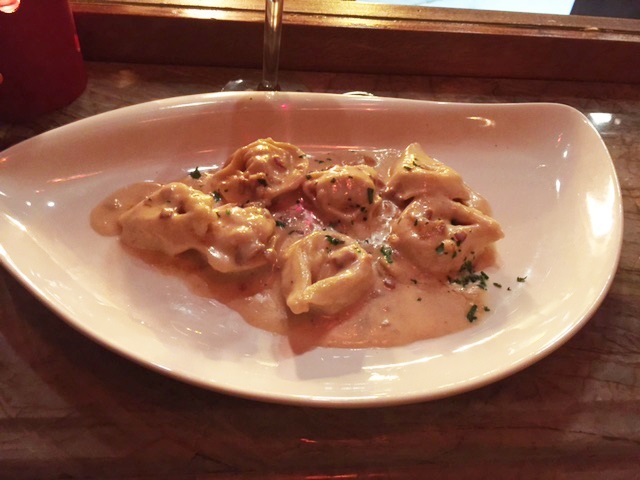 Nevertheless, the new menu was long on new dishes, if a bit wordy: “Hard to Catch Ravioli” and “Dolce and Gabana” sat alongside the more traditional descriptions. Those who know Chef Pirozzi know how much his Italian heritage figures in his menus. This is no different. For instance, he uses imported carnaroli over arborio rice for his risotto. Experts say it gives it a slightly firmer shape during slow cooking and holds more of flavor. I agree. It also extends to the wine list which has a good selection of American and Italian wines, and we were more than happy to go with our waiter’s suggestion of a medium-bodied Valpolicella, which paired well with the intriguing fried Sicilian olives stuffed with gouda. A bit salty for me, but between us we ate the lot. 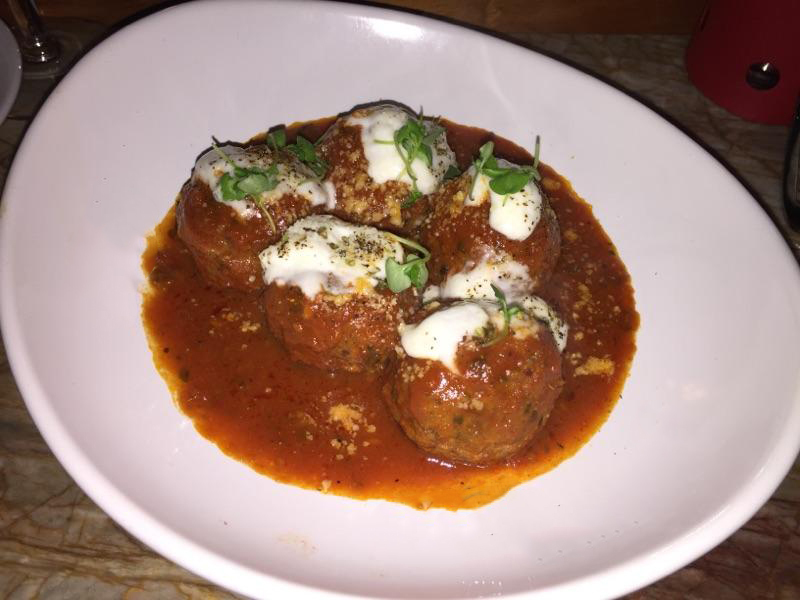 The antipasti menu is ideal for sharing family style, so we opted for mini meatballs and sauce with burrata. Don’t be deceived. They are not mini and while I love burrata, it was hard to see what it added, given its delicate taste against the deliciously full-on flavor of the ragu. The menu also owes a lot to Pirozzi’s grandmother Nonna Titina. It includes her traditional gnocchi recipe with a choice of five sauces and her hearty soup bursting with fresh Roma tomatoes, spinach and zucchini with just the hint of star anise. The latter is a meal in itself, with or without the shredded beef. The pasta section overwhelmed me with choices, but was conscious of diverse dietary needs offering gluten free, whole-wheat and always using organic eggs. Apparently, the short rib pappardelle is the most popular. My friend opted for the Iberico tortellini, which looked lovingly plumped full of two types of cured ham, but the overall dish lacked a punch and they could have been a bit more generous with the sage. I chose the branzini and sides of rosemary potatoes and roasted cauliflower. The fish was cooked to perfection, but sadly the caper and Meyer lemon sauce arrived without the capers. Luckily, Chef Pirozzi spotted the oversight and a freshly prepared sauce appeared complete with capers.